The following is an excerpt from our parish's centennial book Pillar of Faith: Trinity Church at 100, by Gayle Davies-Cooley, published in 1992. Our parish history is narrated in its 256 pages, which includes over 100 black and white photographs and a 40-page color section of our stained-glass windows and other memorial gifts. Pillar of Faith is available at our church office. 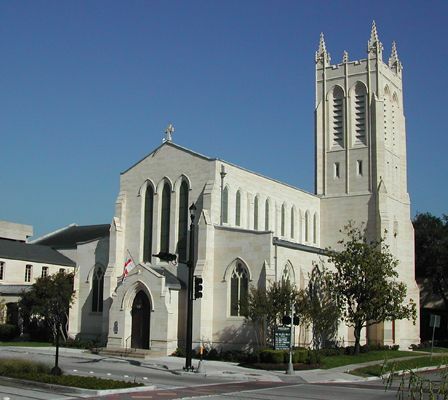 Trinity Episcopal Church of Houston has existed as a house of worship and a center of its community for over a century. As such, it has adapted to the changing nature of the city, as Houston grew from a regional town of approximately 40,000 souls to a dynamic metropolitan giant, the fourth largest city in the United States. With a congregation that grew from a few founding members in the 1890s to several thousand parishioners at its peak, Trinity Church is an example of how spiritual people have contended with the challenges presented during a city's most crucial period of urban development. Founded in 1893 as a mission in a new residential area southwest of downtown, Trinity was a product of Houston's expansion, when distance made it difficult for the faithful to travel to Christ Church, Trinity's mother parish and Houston's initial Episcopal church. After a quarter of a century of existence in wooden buildings, Trinity parish built its present imposing structure (1917 - 1921) in Houston's South End, at the corner of Main Street and Holman Avenue. That structure, designed by some of the leading architects of their time and paid for through the hard work of the congregation, became an architectural landmark. During the late 1910s and 1920s, Trinity entered an era of explosive growth, paralleling that of the city, and became an important center of the Episcopal faith. Always blessed with able clergy and energetic membership, Trinity came into its own. The congregation's many youth and adult activities were community events that attracted wide attention among the general populace and involved many hundreds of people. An integral part of its city, Trinity likewise maintained special relationships with Houstonians of other faiths. With a membership numbering 1,900 parishioners in 1930, Trinity emerged as the largest Episcopal parish in the Diocese of Texas and one of the largest in the nation. After World War II, Houston's growth presented Trinity with perhaps its greatest challenge. As the city physically expanded into the new postwar suburbs, Trinity's membership began to decline. Commercial activity intruded on its immediate neighborhoods, and parishioners moved away. Rather that abandon its historic location, the congregation showed itself to be steadfast. Resurrecting itself from this period of decay, Trinity reaffirmed its mission, this time as a beacon in the inner city where, through much effort, it has become a leading institution in the heart of Houston, determined to enhance the quality of urban life for everyone. Trinity began to deal with more diversity and a larger community beset by modern problems; and in the process, Trinity has secured its place in the future.